Nychos was born in Styria, Austria where he grew up in a hunting family. Surrounded by dead animals while he was little, and growing up in the 80’s when heavy metal was very popular, the anatomy of the dead animals and the 80’s culture became some of the prevailing things from which Nychos drew inspiration when he had developed his interest in graffiti and painting at the age of 18. Over the time, he developed a distinctive and recognizable style which stands out with his dissections and cross sections of human and animal bodies. His trademark style is focused on the reinterpretation of dissected motives combined with colorful outlines. 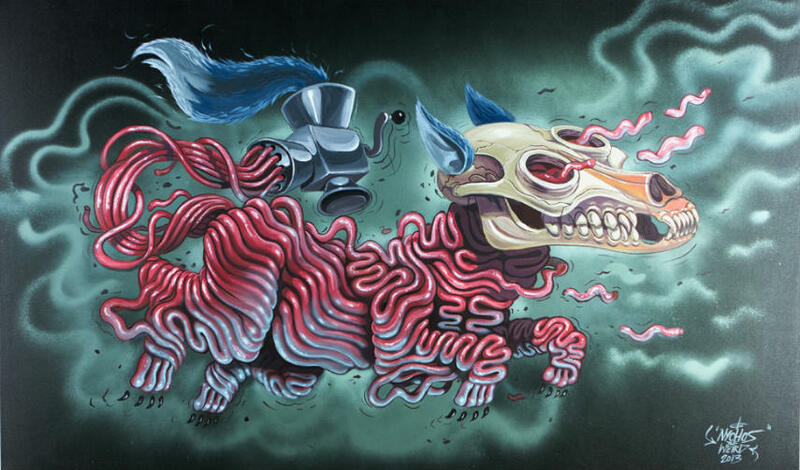 In 2005, Nychos founded Rabbit Eye Movement, which originally started as a street art concept. It fueled and defined the artwork Nychos spread on the streets for the next seven years. In 2012, Nychos found a place for all the members of REM to create and promote their work in the heart of Vienna. The Rabbit Eye Movement Art Space is now a full-time gallery and agency dedicated to pushing the same movement that created it. Some of the members of REM also include Kati (born and raised in Vienna), who now works as the Art Space’s manager; Marije (a Dutch artist now based in Vienna), who has been a member since 2003; and Christian who has started working closely with Nychos since 2012. Promoting and connecting artists from all over the world, REM is the art space which function as a multi-purpose platform for them. 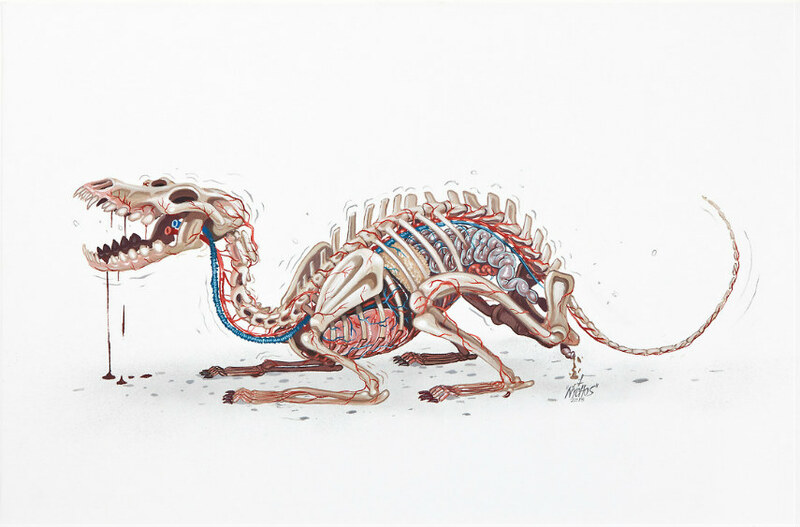 Being a Rabbit, Nychos sees similarities to any underground movement, especially the urban art movement. 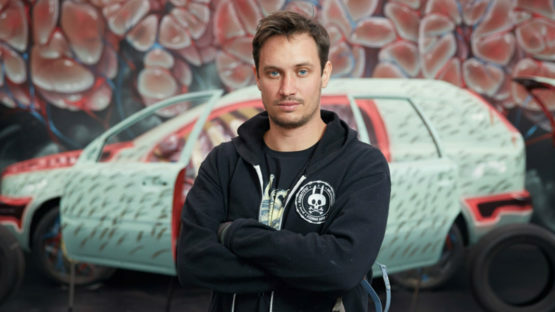 Still unstoppable and led by the rabbit, Nychos often collaborates with the world’s most accomplished painters, making him one of the most noticeable breakout artists from the Austrian scene. In 2011, he teamed up with several “Urban Illustrators” who all have a kind of unique and weird style. Dxtr, HrvB, Cone, Vidam, Look, Frau Isa, Rookie, The LowBrows and Nychos are even called “THE WEIRD”. 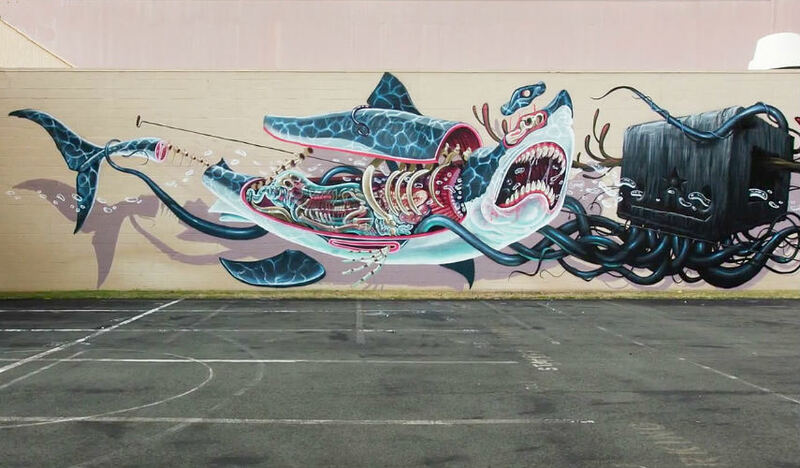 Participating in many events as Art Basel Miami Beach and Pow Wow Hawaii, Nychos’s work can be seen in over fifteen different cities all over the world. The artist is represented by Artstübli, Basel, Kolly Gallery, Zurich and The Rabbit Eye Movement Art Space, Vienna. Nychos lives and works in San Francisco.